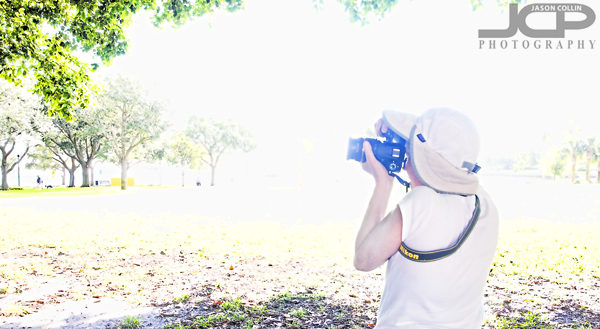 Mari photographing the famous banyan trees in downtown St. Petersburg during our photography lesson.Since our first 1-on-1 DSLR Photography Lesson from just a week ago, Mari has done some significant investing in her photography gear. Gone is her Canon G10 replaced with a brand new Nikon D7000 and lens I use myself, a Tamron 17-50mm f/2.8. Right away it was apparent to Mari how much easier using a true DSLR is. I contend myself that point and shoot cameras are by far more complicated to use than an advanced DSLR (i.e. top LCD screen, two finger dials, all major settings have dedicated button). Now instead of hunting through menus and having to "game" her old camera just to change aperture, on her Nikon D7000 it requires a mere flick of the forefinger. It is likewise for all the other four major settings. So with this new gear I began showing Mari how to manually adjust all settings for shooting in shade, bright sunlight, backlit subject and some tips on how to creatively compose common scenes and landmarks. As always, I advised her to not put the horizon in the center, as that is how we see it with our own eyes. Putting the horizon in the upper or lower third of the frame is almost always more appealing looking to a viewer and makes for a much more interesting photograph. Mari invested in a 4-pack of lessons (thanks Mari!) to help her get started in the DSLR world so I will be seeing her again soon to continue introducing her to new shooting techniques.